Though times are changing now, Chen says marketing programs weren’t readily available at universities in his native country of China. When he came to the United States to attend graduate school, he attended a seminar and became fascinated with how marketing keeps evolving, especially through mobile devices. As he studied data about consumer behavior and how people shopped, he related to so much of it. “It gave me reflection that, oh, that’s what I’m doing as well,” Chen recalls. As an undergraduate in China, business disciplines such as economics, finance and accounting were emphasized. Marketing managers, however, were on their own. “They were basically learning by doing,” Chen says. Chen says he finds that economics and marketing make a good team, especially when analyzing data and trends. He brought his knowledge and enthusiasm to the Walton College as assistant professor in marketing. Chen teaches marketing research to undergraduates. While attending college in his hometown of Shanghai, Chen and his fellow classmates got their doses of American culture through popular TV shows such as Grey’s Anatomy and Desperate Housewives. Though fictionalized accounts, the shows helped fuel his desire to explore the world – namely America and its thriving industries, including digital media. 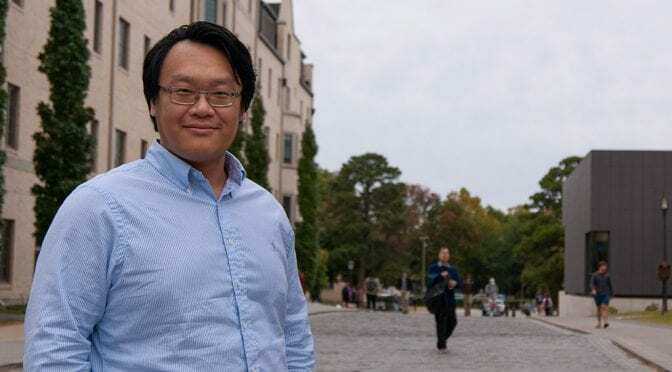 After earning his economics degree, Chen was accepted in the doctoral program at Cornell University in New York, where he earned his Ph.D. in marketing. One of the first things he did after arriving in the country was to see how Chinese food – American style – measured up. He was pleasantly surprised and gained a newfound love for General Tso’s chicken, which isn’t available in China but should be, Chen says. When there was an opening for a marketing professorship at Walton, Chen applied. During his campus visit, he met with Walton’s marketing faculty as well as Matt Waller, Walton College dean, and Associate Dean Anne O’Leary-Kelly. He says he was interested in learning that Northwest Arkansas has changed dramatically during the past several years due, in part, to the dynamic industry in the area. On the research side, there is much to learn from local retail industries such as Walmart and Sam’s Club, he says. He was also impressed with stories about Walton’s innovations in technology and start-up businesses. “It’s very exciting to be a part of it,” Chen says. Having lived in Shanghai, with a population of about 24 million, followed by Ithaca, New York, which has only about 31,000 people, Chen says he has found a “sweet spot” with Northwest Arkansas. “Fayetteville is the ideal place for me to live,” he says. He says he’s “touched and appreciative” how several of the marketing faculty were helpful in guiding him through his first semester at Walton, including how to adjust his schedules that best benefit students, whom he found are extremely motivated to learn, especially when it comes to mobile marketing. In fact, their enthusiasm is so infectious that, at times, Chen finds he is learning from his students as well, which inspires him to be the best teacher he can be. Chen’s research includes looking for ways to effectively target audiences through mobile marketing. For example, marketers might send texts to people while they commute on subways as they are more likely to purposely avoid eye contact with other passengers by looking at their devices. He says that taking this kind of approach – observing people’s daily routines and discovering when they’ll most likely be on their smartphones – is one facet of a successful mobile marketing campaign. He’s also fascinated by how consumers get their information. In the past, it may have been through visiting stores and examining products. Now, it’s often done through the internet. What consumers look for and how they do it can be useful information to marketers as they develop strategies, he says. Chen says he’s eager to explore Northwest Arkansas, especially the region’s parks. When that’s not possible, there’s always television. He says one of his favorite pastimes is watching the National Geographic Channel’s long-running show, Air Crash Investigation. He began viewing the program with his parents years ago during a time when air travel scared him. Since then, he has flown several times. He’s over it.